At our Kinda-Mindi child care centre Castle Hill, we aim to create an engaging, enriching and inspiring learning environment for children aged 6 weeks to 6 years. 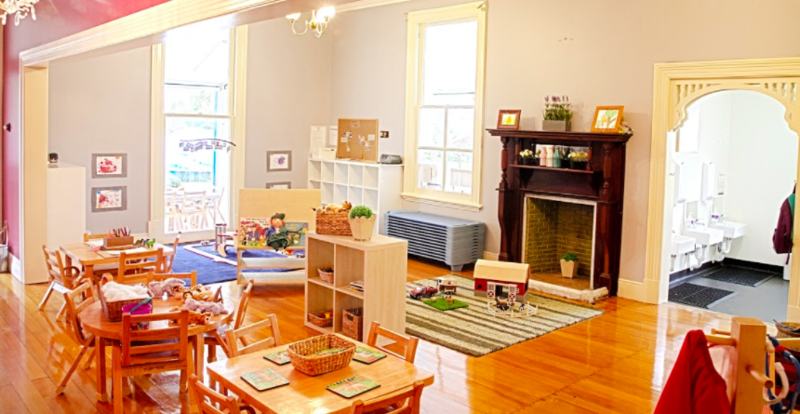 Our Castle Hill childcare centre is designed to support your child’s ability to learn and explore, as well as promote the use of imaginative thinking and curiosity. We are renowned for providing excellence in childcare through play based curriculum, guided by the outcomes of the Early Years Learning Framework. The framework outlines principles, practices and outcomes that support your child’s learning experience as they transition to school. In line with this, we designed our Castle Hill location with indoor and outdoor play areas to stimulate your child’s curiosity. Your child is guaranteed to have fun while learning at our Castle Hill preschool and childcare centre. Contact our Castle Hill childcare and early learning centre on (02) 8850 3365 for more information or to book a tour in our child care centre. Our outdoor area has a natural landscape filled with real plants and foot paths that children can explore. We provide a protective sun hat along with a protective cover for our play area to keep them cool. Rest assured that your children are safe as they discover, investigate, and learn more about the world. Kinda-Mindi Castle Hill childcare and early learning centre is located in a 130 year old Heritage Listed Building which gives our centre a unique feel of community. It has been modified to cater for children aged from 6 weeks of age to 6 years. The children have fun exploring, discovering and imagining through play-based activities in this very unique environment. Passion for caring and teaching children drives our early childhood educators at Kinda-Mindi. All of our educators are trained and qualified to provide your child with the highest standard of childcare and early learning education. Our Castle Hill early learning centre is staffed by educators that currently hold degrees, certificates and diplomas on children’s services and Early Childhood Education & Care. To learn more about your child’s progress and our school-readiness curriculum, you may approach our friendly staff who will gladly answer your concerns. Castle Hill is a family-oriented suburb that offers a comfortable environment with its harmonious blend of city and country. Families living in this area have easy access to large shopping complexes, cinemas and department stores while still enjoying the tranquillity of rolling fields and open spaces. Castle Hill is one the most kid-friendly suburbs with great activities available for children in these shopping centres and open fields. For the best childcare services in Castle Hill, visit our Castle Hill childcare and early learning centre at 14 Garthowen Crescent, Castle Hill NSW 2153. You may also contact us on (02) 8850 3365 to book a tour and learn more information.